67-66 with 6:20 to play - GET TO A TV NOW HOKIE NATION! #BADGERS Showalter is out with fifth foul. Va Tech about to tie with 5:37 left. Showalter fouls out with 5:37 left. Virginia Tech's Zach LeDay can tie the game with a free throw. And Showalter's gone on what should have been a charge. Zak Showalter picks up his fifth personal foul. He's done for the day. Jordan Hill comes in. Woof. Trash block call on Showy. Just fouled out. Koenig has the school record. Now eight 3-pointers. MAMA! THERE GOES THAT MAN! Bronson Koenig absolutely TAKING OVER tonight! BK with his EIGHTH 3 of the night! Bronson Koenig has set a new school record with 8 3-pointers, getting a friendly shooters roll. Badgers lead 72-68 with 4:39 left. Tell me how Koenig does not make an NBA roster next year? His third straight 20+ point game ???? Hokies in the double bonus. 19 fouls called on the Badgers for the game. Cool. #Badgers up 72-69 with 3:55 remaining. Happ now with four fouls. #Badgers in B1G foul trouble. Showalter out and Happ has four with 3:55 left. 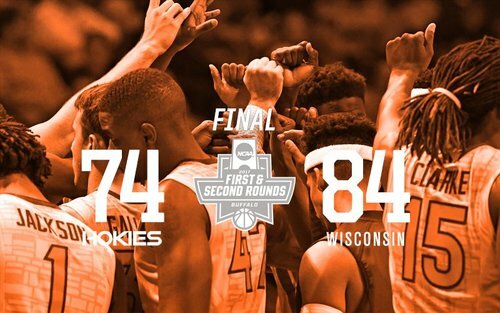 UW 72-69 but Hokies with 2 Fts. Wisconsin leads 72-69 with 3:55 remaining. Zak Showalter has fouled out and Ethan Happ just picked up his fourth. Questionable officiating at best. Makes you wonder if Coach K dialed them up before the game. 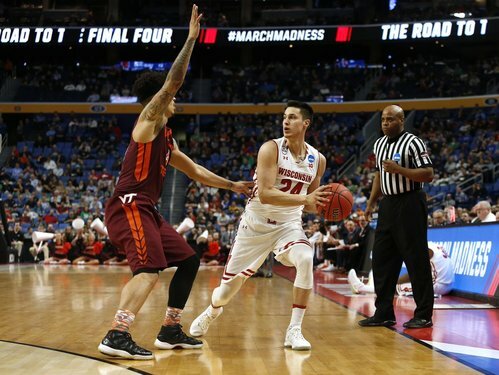 Bronson Koenig up to a game-high 26 points (8-15 3FG). BK is now just 1 pt away from a career high. Just assume there will be a foul call on any play in the post from here on out. This has been a two-possession game or less since the 17 minute mark on. Really good defensive possession by Brown there. Hayes making play after play for #Badgers . Badgers up four with 1:40 left. Hayes has a double-double with 16 points and 10 rebounds. He has 14 points and seven rebounds in the second half. Koenig has set a career high with 28 points. 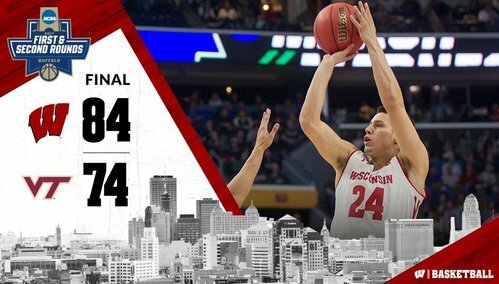 Koenig has gone ice cold but Badgers have come up big on the offensive glass. Bronson Koenig got us feeling like... ???????????????????????????????? Huge. Koenig makes it an eight free throw game with 35 seconds left. Third straight double-double for Nigel Hayes. Badgers win. Appropriately, we cannot leave until free throws are shot. Final: #Badgers 84, Virginia Tech 74. 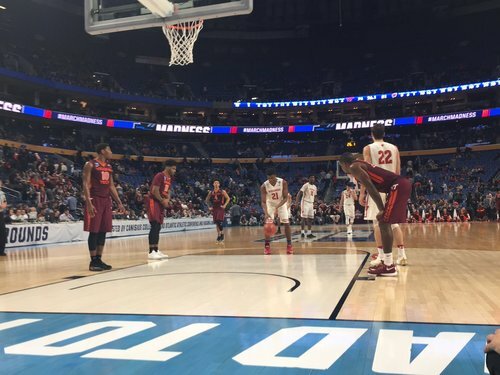 The Badgers end game with a 10-1 run to advance to round of 32 game vs. Villanova. Free throws (and Koenig bombs) win games.